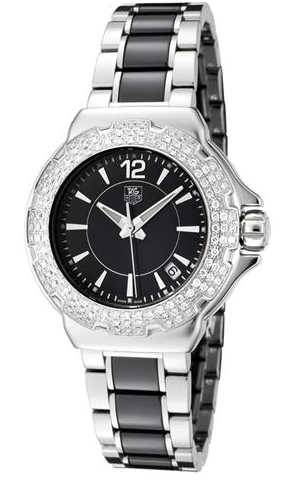 The elegant women's TAG Heuer Formula 1 Steel and Ceramic Full Diamonds timepiece. Encrusted with 120 Wesselton diamonds, the TAG Heuer Formula 1 WAH1214.BA0859 is an elegant, feminine watch sure to dazzle. This steel and ceramic full diamonds timepiece is a winning combination of power and breathtaking style. It’s Swiss Made with a polished steel case, a polished steel/ black ceramic strap with a butterfly folding clasp, and a sapphire glass face. When the battery life is waning the End-Of-Life-Indicator will signify that the battery is weakening and the second hand will make four-second jumps every four seconds. This is to help you realize the battery needs to be replaced before it is completely exhausted. 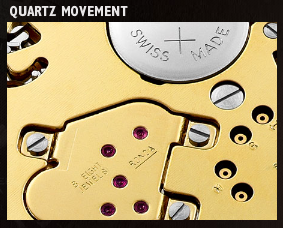 A look at the battery powered Quartz Movement technology of the Formula 1 Steel and Ceramic Full Diamonds watch. – In order to ensure that it remains in its best condition you should avoid all chemical products while wearing this watch, including detergents and cosmetics. – Your watch should be cleaned with diluted soapy water and a soft brush to wipe away impurities, and dried with a soft cloth. – An annual check-up is recommended to ensure that the rubber, water-resistant seal is doing its job and keeping water out. – If temperatures spike or change quickly, a slight film of condensation may form beneath the face of the watch. It will disappear by itself with no harm to the watch but could be bothersome. 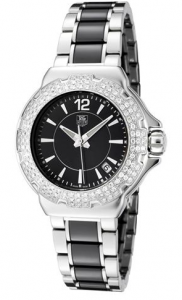 All in all, the Tag Heuer Formula 1 WAH1214.BA0859 is a lovely addition to any woman’s accessory collection. It is sure to shine with its .75 carats while keeping you punctual all the while. It is a delightful blend of cutting-edge technology, function and beauty.